The flags of Panama, Guatemala, Colombia, Cuba, Argentina, and other countries of the western hemisphere will be going up on street poles along 24th Street in the next few weeks, repainted and revitalized after years of neglect. A conspicuous absence? The Mexican flag, says the artist in charge of the restoration effort. “I have a feeling it’s in someone’s house,” said Aureliano “Yano” Rivera, adding that Brazil, too, is missing. 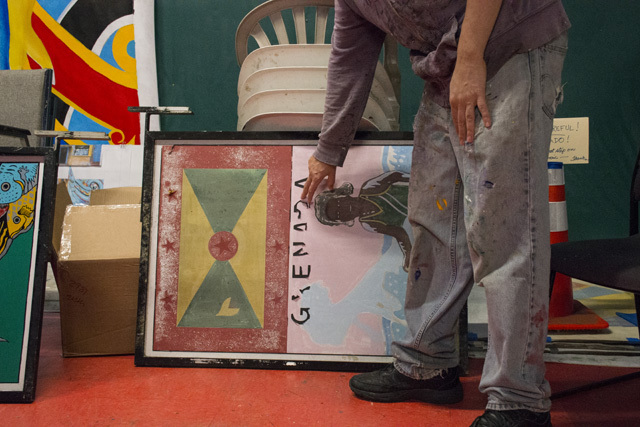 Rivera has been leading a small group of Precita Eyes artists charged with repainting and varnishing the faded flags that have hung high up along 24th Street since the mid-1980s. Rivera, like many others, had no idea they were up there until tasked with restoring them. “No one had noticed them,” said the 33-year-old, who has been working on the flags since May. 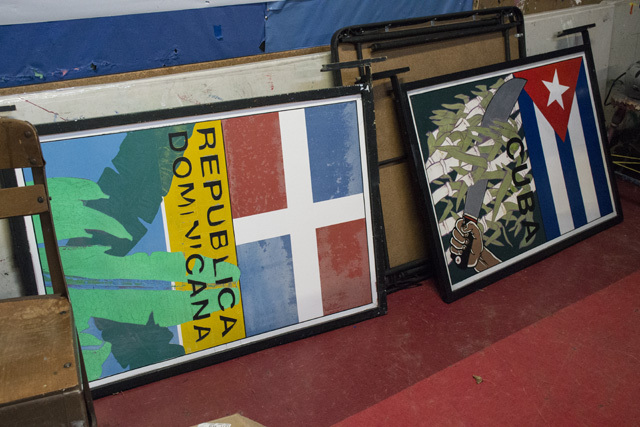 “They were put up high, the trees grew around them, and a lot of people didn’t know they were there,” added Erick Arguello, the president of the neighborhood association Calle 24, which first proposed the restoration of the 27 country flags. 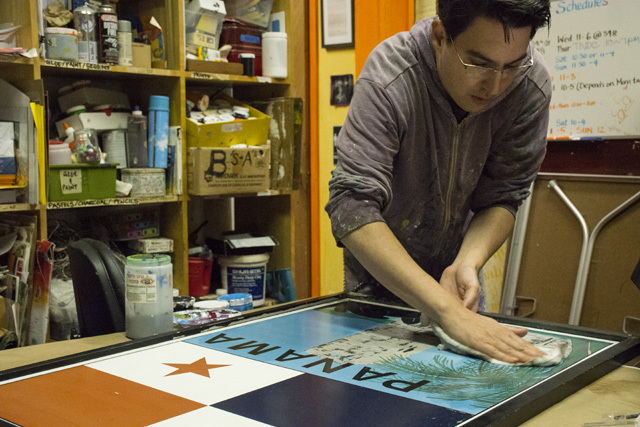 The Flags of the Americas project is part of a larger undertaking by Calle 24 to brand and beautify 24th Street. That designation has unlocked funding and resources from City Hall, including the $100,000 awarded to Precita Eyes after it won the bid to restore the flags. Street signs reading “Calle 24 Latino Cultural District” have been recently installed up and down the street, and the city has even hired a “corridor manager” to connect small business with services. And in a couple weeks, the restored flags will re-adorn the commercial corridor. “It’s important for people to see the real commitment and physical representation of the city’s commitment to supporting this district,” said Joaquin Torres, the deputy director of Invest in Neighborhoods with the Office of Economic and Workforce Development. Invest in Neighborhoods is a pilot program by Mayor Ed Lee that provides funding and services to 25 business corridors city-wide, like Chinatown and Noe Valley. 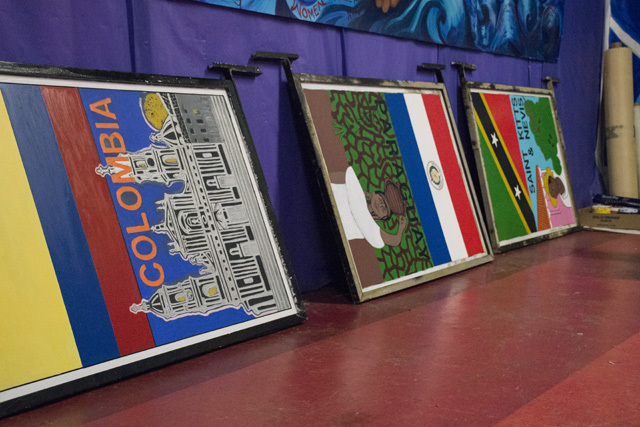 The 24th Street corridor is part of the initiative, and the flag restoration project is a “cultural, visual representation” that will help “establish Calle 24 as a place,” Torres said. Roberto Hernandez, for one, is ecstatic. Hernandez said he first proposed the idea of the flags in the 1980s and got the funding to have them installed. Back then, he said, a group had installed flags with a 24th Street logo on traffic poles, but the fate of those flags cooled him to the idea of country flags. 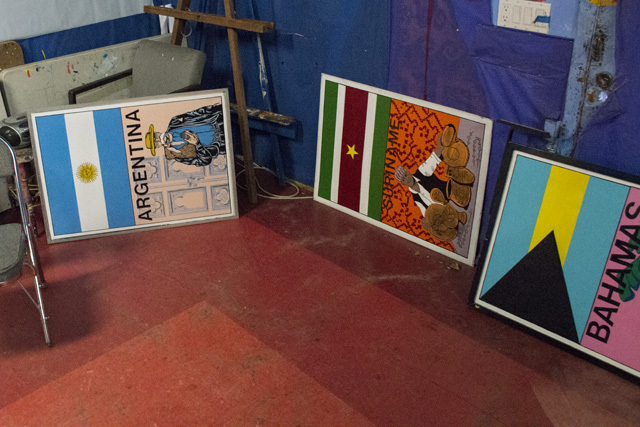 After talking to René Castro, a Chilean artist at the Mission Cultural Center for Latino Arts at the time, the idea of flags evolved into a project with accompanying artwork beneath each flag. 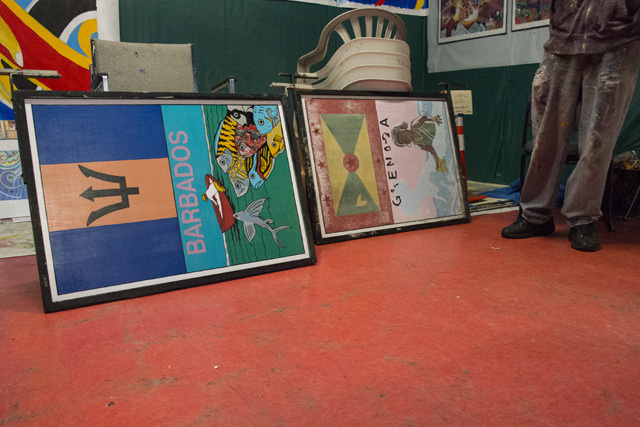 The artwork for each flag would be done by a different artist. The unique designs, he hoped, would prevent their theft. So when told about the missing Mexican flag, Hernandez was puzzled. The majority of the flags remained, however, but 30 years later the wind, sun, and trees have chipped and dilapidated the installations. Their vinyl lettering is peeling off and their paint is barely visible, sometimes gone altogether. Leaning over the Panama flag, Rivera described his restoration process: He washes the paintings top to bottom and removes any excess dust before scraping off the vinyl lettering. He then paints a layer of varnish to create a barrier between the original paint and his own. 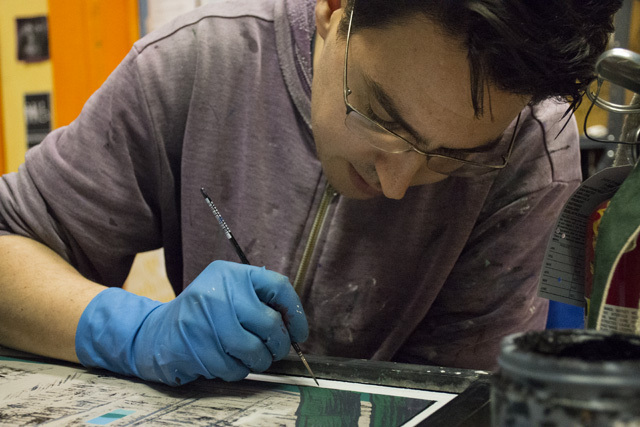 He then mixes paint to match the flag’s colors and goes line by line on top of the original artwork, keeping the same design but painting it anew. “The hardest ones are where we don’t know the original,” he said, showing off a picture of an almost-invisible Paraguay flag. Rivera is considerate of respecting the original work and wants to ensure he mimics the design exactly, he said, which can be difficult with little to go on. “The uncertainty and the risk, that slows you down,” he said. Still, he has moved at a tight clip. Almost all of the flags are done, he said, and he has “just a couple” left, which could take him between four and 24 hours of work time each. They will be installed later in the year, he said, though no date has been set. For Frutilandia, a Puerto Rican restaurant at 24th and Lucky streets, that day could not be any sooner. Its owners, Rivera said, were upset when the flag was taken down right in front of their restaurant — it was the Puerto Rican flag, and it was natural marketing for the restaurant. Other public art may be coming to the corridor. Entry archways near 24th and Mission streets could welcome people to the neighborhood, said Arguello, the Call 24 president. Mayan temple-like structures could be erected at the BART Station, and metal sculptures hanging up and down the street could mean stringed lights all year, he said. And for Hernandez, the time is now to commemorate the Latino community. “There’s good will and guilt” on the part of City Hall, he said. 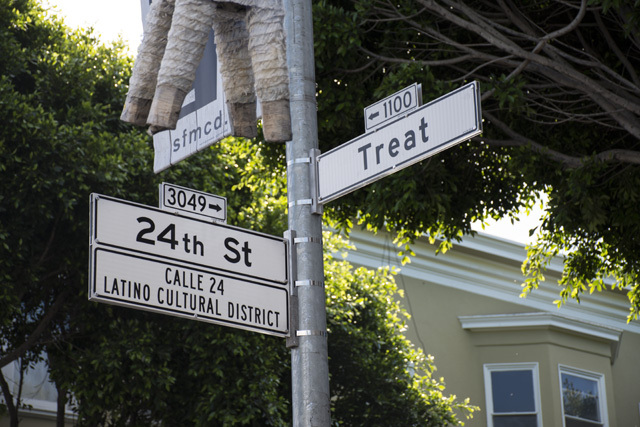 Given the Mission District’s gentrification crisis, some city officials are sympathetic — and can unlock funds for things like public art, he said. I remember from 1960 till I left in 1979 there was also a strong Italian and Irish culture in the mission and Noe Valley district. I don’t see those flags. That’s because you don’t see many Italians and Irish in the Missions.